Mexico City street foods and late night bar is what you will find at San Pedro in Red Hook. The restaurant located on Van Brunt Street is serving up tacos (carnitas, roasted mushrooms, carne asada, lenua and dirty) as well as quesadillas, tostadas and ceviche. Tamales are also offered in three flavors: rojo, verde and mole. 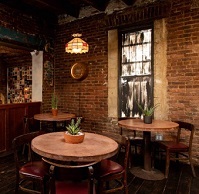 The space has a casual feel with exposed brick and full bar.